Steven M. Bragg, CPA, has been the chief financial officer or controller of four companies, as well as a consulting manager at Ernst & Young and an auditor at Deloitte & Touche. He received a master's degree in finance from Bentley College, an MBA from Babson College, and a bachelor's degree in economics from the University of Maine. He has been the two-time president of the Colorado Mountain Club, is an avid alpine skier and mountain biker, and is a certified master diver. Mr. Bragg resides in Centennial, Colorado. He is also the author of Accounting Best Practices and Accounting Policies and Procedures Manual, Fifth Edition (both published by Wiley). PART I HOW TO GO PUBLIC. CHAPTER 1 The Initial Public Offering. Reasons Not to Go Public. The Cost of an IPO. Registering for and Completing the IPO. CHAPTER 2 Acquiring a Public Shell Company. Pros and Cons of Acquiring a Public Shell Company. The Mechanics of a Shell Company. CHAPTER 3 Listing on a Stock Exchange. PART II DEALING WITH INVESTORS. CHAPTER 4 Investor Relations Overview. CHAPTER 5 The Investment Community. CHAPTER 6 Regulation FD (Fair Disclosure). Impact on Earnings per Share. Adequate Disclosure and Repurchase Instructions. Impact of Repurchases on Rule 13e-3. PART III DEALING WITH THE SECURITIES AND EXCHANGE COMMISSION. Declaring a Registration Statement Effective. CHAPTER 9 Regulation D (Sale of Unregistered Securities). CHAPTER 10 Rule 144 (Registration Exemption for Resale of Securities). CHAPTER 11 Rule 10b5-1 (Stock Trading Plans). CHAPTER 12 Regulation A (Small Issue Exemption). 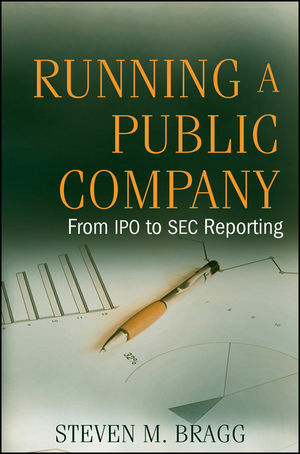 CHAPTER 15 Insider Securities Ownership and Trading. CHAPTER 17 Regulation M-A (Mergers and Acquisitions). CHAPTER 18 Private Securities Litigation Reform Act (Forward-Looking Statements). The Private Securities Litigation Reform Act. Other Significant Parts of the Act. Part IV SPECIAL ACCOUNTING STANDARDS FOR A PUBLIC COMPANY. Example of Interim Reporting of Various Expenses. Second Example of Interim Reporting of Various Expenses. CHAPTER 22 Earnings per Share. Example of EPS Computation—Simple Capital Structure. Preferred Stock Dividends Payable in Common Shares. Example of the Impact of Contingent Stock Issuances on Earnings per Share. Examples of EPS Computation—Complex Capital Structure. Participating Securities and the Two-Class Method. The Effect of Contracts That May Be Settled in Stock or Cash on DEPS. Inclusions/Exclusions from Computation of DEPS. The Effect of Contingently Convertible Instruments on DEPS. Example—Contingently Convertible Debt with a Market Price Trigger. Effect on EPS of Redemption or Induced Conversion of Preferred Stock. Earnings per Share Implications of Share-Based Employee Compensation. Presentation of Earnings per Share. CHAPTER 23 Staff Accounting Bulletins. CHAPTER 24 Regulation G (Non-GAAP Information). Part V CLOSING THE BOOKS OF A PUBLIC COMPANY. CHAPTER 25 Constructing and Filing the Quarterly 10-Q and Annual 10-K Reports. CHAPTER 26 Controls for Financial Reporting. CHAPTER 27 How to Take a Company Private.